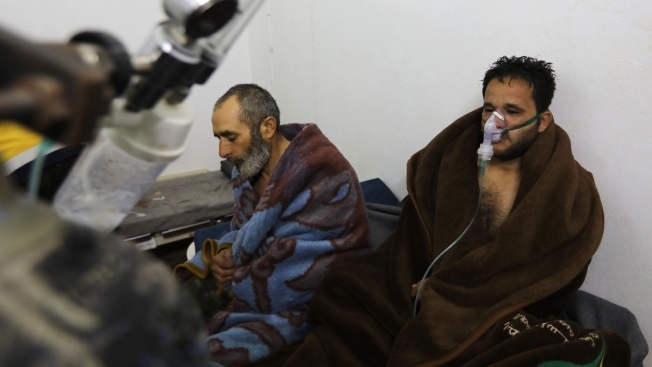 This Feb. 4, 2018, photo shows Syrians said to be suffering from breathing difficulties at a field hospital in a village on the outskirts of Saraqeb following Syrian regime air strikes on the northwestern town. An international chemical weapons watchdog said chlorine gas was released in the area that day. The international chemical weapons watchdog said Wednesday that chlorine was likely used as a weapon in the Syrian town of Saraqeb in early February, the latest report of poison gas being unleashed in Syria's civil war.